California weather might be pretty nice, but being next to the ocean some evenings can get quite cool. I always carry an extra top, sweater, or a light jacket for layering if I am out and about. If I can't cram a sweater into a small bag or if I don't want to bother holding it, then I have to be creative. An awesome vintage denim maxi dress and a basic stripes top can be worn in many different ways and here I am showing you two! Vintage denim maxi by Rampage c/o Une Femme Este Une Femme. White strappy buckled wedges from Hong Kong. Triple labradorite stones ring c/o TooSis. Druzy cluster and pearl ring c/o KallisteNYC. 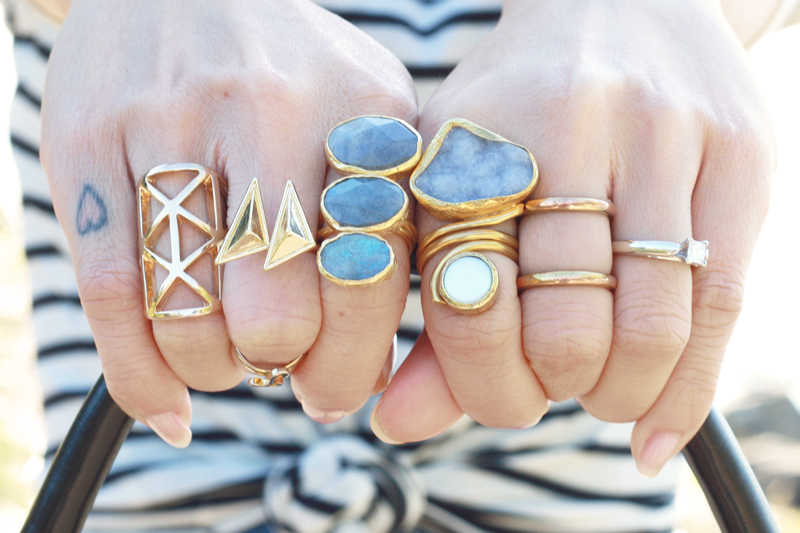 Love all your rings and your vintage skirt! Oh my god, THOSE RINGS. What a gorgeous colloection! And layering a shirt over a dress is one of my favorite things to do, but I never thought of wrapping it around my waist, 90s style. I love how it looks, though! I'm definitely going to have to try that!